On the left, Jesus is clothed. there’s virtually no blood, no signs of beating and no evidence of torture. Indeed, both pictures represent state-sponsored capital punishment, but the edginess I feel may be about our discomfort with either (1) the fact that this crime against humanity is occurring right now, this month, at a prison near us. Or (2) we are uncomfortable with our own hesitancy to see the gospel’s poignancy in anything so political as the death penalty. 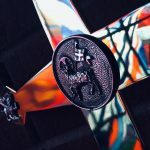 In a world of political polarization and justification, we’d rather reduce the gospel to souls and heaven, rather than risk muddying the lines between church and state. And fair enough, given Christianity’s poor track record of political meddling. In so doing, you remove the scandal–and that, I think, is problematic. 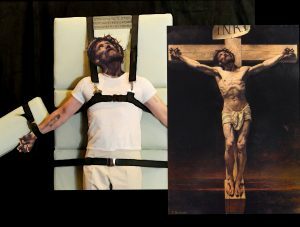 Some artists emphasized the realism of Christ’s agony, but that often glorified agony rather than glorifying Jesus–some such pieces can feel voyeuristic and sadistic, yet managing to sidestep the gospel itself. Well, back to my pondering. 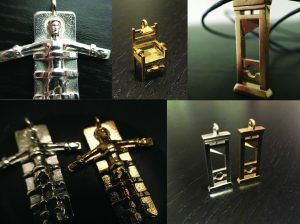 I remembered that people used to say, “If Jesus’ execution were in our era, we’d be wearing jewelry that featured modern forms of execution, such as the electric chair or the guillotine.” And why not? I was never sure if this was meant as a critique. What do the pieces below communicate? I’ll that to your ponderings, but there it is.